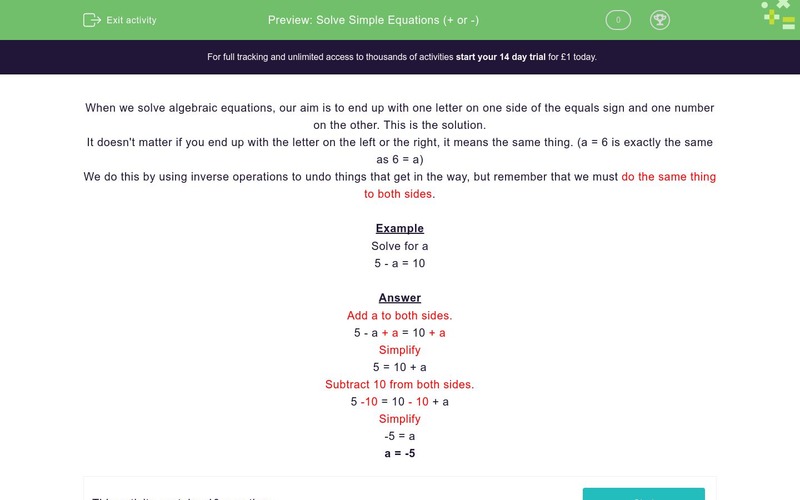 In this worksheet, students solve simple one-stage equations. When we solve algebraic equations, our aim is to end up with one letter on one side of the equals sign and one number on the other. This is the solution. We do this by using inverse operations to undo things that get in the way, but remember that we must do the same thing to both sides. Add a to both sides. If we subtract 5 from each side, we are left with a = 10. If we add 3 to each side, we are left with a = 18. If we subtract 7 from each side, we are left with a = 14. Here we must subtract -3 from each side, so we are left with a = 18.